All true, but they warn you not. You will endure pastel tee-shirts of every hue, whole families and extended families winding down their day in NYC, the next best thing to Great Adventure. True, as well, the city welcomes people from all over—and yes, even tourists. And you went to Ellis Island and the Statue of Liberty, right? And that made you feel like you were in a Fassbinder movie for weeks. 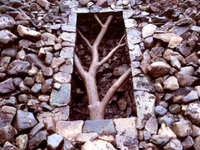 So, yes, brave the jam-packed elevator, brave the busloads of tourists, brave, worst of all, the thought that someone might think you’re a tourist yourself—brave it all to go see the Andy Goldsworthy installation of white cedar split-rail domes housing ovoid granite stones stacked in towers. To Manhattanites, the sense that the vista of our city is the vista of the world is more politically and historically true than ever. We are not exactly Americans, not exactly Europeans. We are the black sheep of the first world, and the target of the third world, and we are adored by all. And, we’re here—sometimes on our roof garden—ineluctably attuned to the question of who will toss the next stone, and who it’s gonna hit.